Bread for Life serves men and women who have the will to improve their lives. The support students receive in the Bread for Life program allows them to make a fresh start in the workplace as they take their training and classroom experience in kitchen prep, banquet service, event set-up, and housekeeping to embark on a career path in the hospitality industry. The program is supported by grant funding and generous donors who recognize the value of rebuilding lives and nurturing responsible citizens in the community. 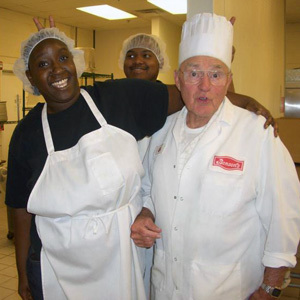 Recent Bread For Life graduate Shawanda Johnson talks with us about her new career at UGA as well as the impact Bread For Life has had on her life. After graduating in November 2012, Shawanda obtained employment as a Program Assistant with the UGA Cooperative Extension's Expanded Food and Nutrition Education Program (EFNEP). Watch the video to hear about what she gained from Bread For Life to prepare her for new job.